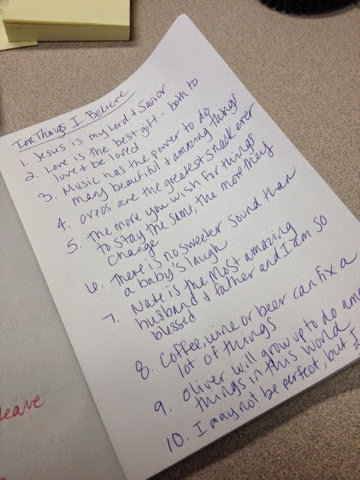 I participate in several Facebook groups for bloggers and one of the groups, Let Your Blog Shine, is starting some weekly writing prompts and I really like the idea, so I'm starting out with the first one today "Ten Things I Believe." I actually wrote out my post in my actual journal first and then took a picture, but I'll still list them for you as well! Hopefully you'll learn a little more about me through these writing prompts - and hopefully still like me too, even if we don't see eye to eye on some of these things. That Jesus Christ is my Lord and Savior. That to love and be loved is one of life's greatest gifts. And that everyone has a right to love whomever they want to love. That music=life, it has the power to do many beautiful and amazing things. I am completely powerless around them. That the more you wish for things to stay the same, the more they will change. That there is no sweeter sound in the world than hearing your baby laugh. that he is the most amazing father to Ollie. depending on the time of day or situation. That Oliver will grow up to do amazing things in this world. That I may not be perfect, but at the end of the day I think I'm a pretty good person.